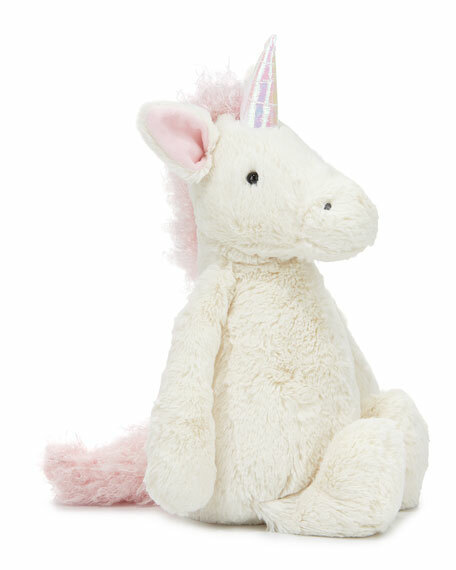 Jellycat "Bashful Unicorn" plush toy features shimmering horn, squishy hooves, and curly mane/tail. Extra-soft, cuddle-ready with perky ears and rounded belly. Plastic pellet fill keeps animal sitting upright. Suitable for newborn and up; do not leave in crib/cot. Established in London in 1999, Jellycat is known for luxuriously soft toys with a flair for design. Using unique materials, and heavily influenced by the dynamic world of fashion, Jellycat unveils myriad new designs each year, including floppy bunnies, bears, and puppies. For in-store inquiries, use sku #1745582.